Companies in the business of transporting liquid or gases have to make a huge investment in the steel pipelines, so it is desirable to operate them without changing as long as possible. That is why these assets are considered as critical issues in this industry. That’s why new technologies to carry out the inspection of these pipelines has appeared, like pipe inspection cameras or a technology reliant on acoustic activity detection. 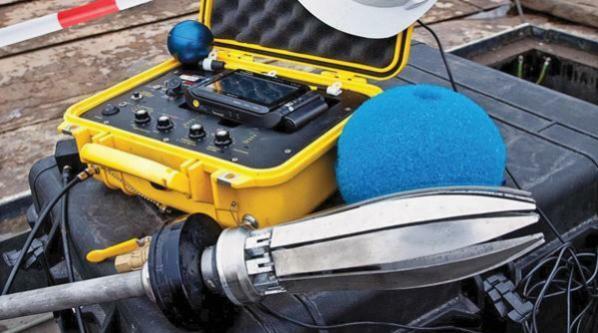 This acoustic-based technology detects anomalous acoustic activity associated with leaks or pockets of trapped gas in pressurized pipes. The device can complete long surveys (16-18 hours of run) in a single deployment without disruption to regular pipeline service and it can detect very small leaks. It is composed of an aluminum alloy core that contains a power source, electronic components and instrumentation. The aluminum core is encapsulated inside a protective outer foam shell, which allows the device to be propelled through the pipeline by creating a larger surface area for the water flow to make contact with. The SmartBall is easily deployed into the flow of a pipeline, traverses the pipeline, and is captured at a point downstream. During the journey, the SmartBall position in the pipeline is tracked with SmartBall Receivers (SBR’s), which detect ultrasonic pulses emitted from the SmartBall. The SBR devices measure the time it takes for the pulse to travel from the ball to the SBR and calculates an approximate location of the ball. More importantly, as the ball passes the SBR it provides a discrete point where the location of the ball is known at a moment in time, which is very useful when locating leaks and gas pockets. Finally, once a suspected leak or pocket of trapped gas is identified during the data analysis, it is located by creating a velocity profile from the accelerometer data between two SBR devices. This is another device that operates inside a normally operating conduct. The device has the same functionalities as the above-mentioned solution, but aditionally, it is equipped with a camera that transmit images in real time to the operator computer through a cable connected to it. Apart from the detecting leaks, this device can also detect illegal service line connections. Sahara is equipped with a parachute that is opened once inside the pipeline to travel with the water flow. In the case of this method, the device is connected through a cable to a computer on the ground surface to allow the operator not only to receive the video images but also to control the device. Finally, Sahara is able to locate leakages with a precision of up to 500 mm, it has a proven sensitivity to leaks as small as 0.05 gal/min and the distance it can travel is 6000 feet per insertion. In Ennomotive, we contact with different companies that are looking for solutions like these and you can be the one who find the best one.